 A philosophical and factual history of race relations in this country. Ashmore (Unseasonable Truths, 1989), a distinguished writer, editor, and teacher, is both erudite and immediate--a straight thinker of strong feeling who has been a long-time participant in, as well as observer of, the racial struggle. Ashmore's account, dense with information, begins even before his direct involvement (he was executive editor of the Arkansas Gazette during its Pulitzer Prize-winning coverage of the integration of Little Rock's Central High). He gives the history of segregation, extending into circumstances and qualities of personality and character not obviously connected to his subject, but essential to the full understanding of it. Nixon's weaknesses, Arkansas governor Orval Faubus's virtues, Vietnam's pressure, Roosevelt's and Eisenhower's shortcomings, Truman's greatness, and Martin Luther King's nobility, as well as the distortions that come from media attention are all part of the story. 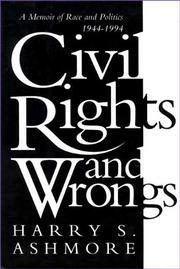 Over the years, the author has met almost everyone, and seen everything, pertaining to civil rights, and he shares his long and full view here. Minutiae (Know what a Yellow Dog Democrat is? Remember for which politician the term ``egghead'' was coined?) blend with the impact of individuals, the findings of think tanks and commissions, and the critical strains of political leanings from Dixiecrats to gradualists to black separatists. Ashmore ends by quoting a lovingly rendered Thurgood Marshall (``You know...sometimes I get awfully tired of trying to save the white man's soul'') and by saying himself that ``the task of redemption remains unfinished...,'' though his hope is evident. A highly detailed, encompassing account that is both clear and complex, honoring the intricacies and complexity of America's deepest problem.